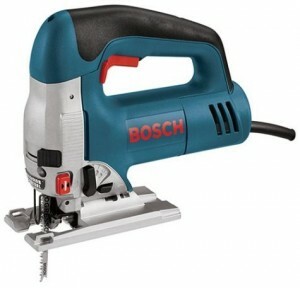 The Bosch Electric Jigsaw has a precision control system, which eliminates blade wander for precision cuts. The one-Touch blade change allows for one-handed insertion and lever ejection. The quick bevel adjust cast aluminum foot has an easy-to-read scale and the t-shank machined plunger is robust, with a 3-point connection and no blade play. In addition, this model has a variable speed trigger. Max Capacity in Mild Steel: 3/8"
Max Capacity in Plastics: 1-1/4"
Ma Capacity in Stainless Steel: 1/8"